Claudia is the newest JENNiRADIO Rising Star. You’ll hear two of her songs – “3 Leaf Clover” and “Hollywood Sunset” – in rotation on AM 1240 in Albuquerque and at JENNiRADIO.com worldwide. Also, one of her music videos will be featured in a future episode of the JENNi20 Countdown. 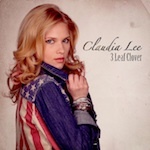 You can learn more about Claudia on her Rising Stars page right here on JENNiRADIO.com. Claudia is also a generous supporter of the Jennifer Smart Foundation’s Find Your Voice program. To follow Claudia’s example, click here to make your own donation.